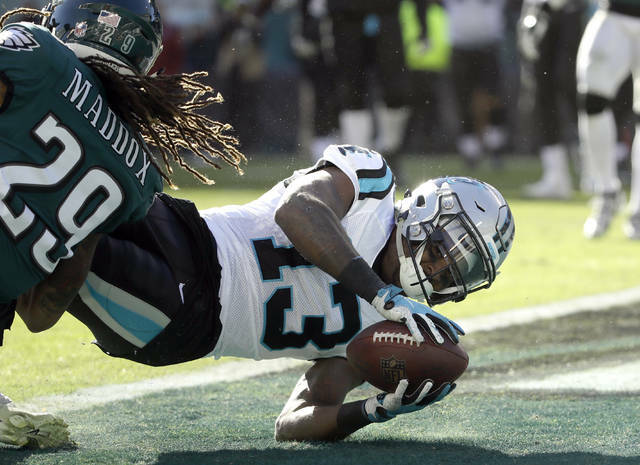 PHILADELPHIA (AP) — Cam Newton tossed a 1-yard touchdown pass to Greg Olsen with 1:22 left and the Carolina Panthers overcame a 17-point deficit in the fourth quarter to beat the Philadelphia Eagles 21-17 on Sunday. Julius Peppers sacked Carson Wentz, forcing a fumble on fourth down from the Panthers 14, to seal the victory. After Carolina took the lead, the Eagles started at their 30. A 48-yard pass interference penalty on James Bradberry against Alshon Jeffery put the ball at the Carolina 22. Eric Reid appeared to intercept Wentz’s overthrown pass but the play was overturned on a video review. Wentz threw incomplete to Jeffery in the end zone on third-and-2 and was stripped on the next play. Down 17-0, the Panthers started their rally when Curtis Samuel ran in from the 14 on a reverse but Graham Gano missed the extra point. 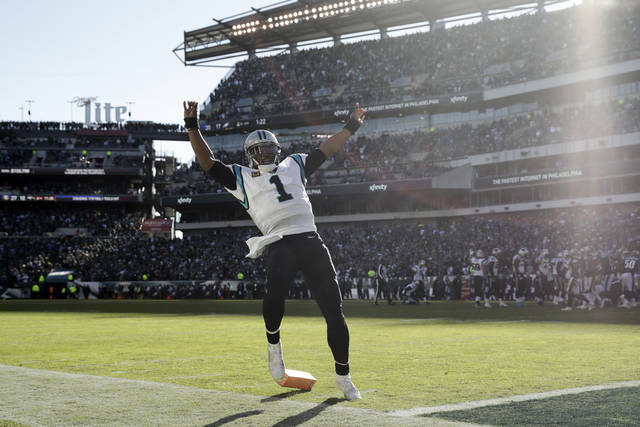 Newton then quickly drove the Panthers 87 yards, tossing an 18-yard pass to Devin Funchess. He connected with Jarius Wright on the 2-point conversion with 4:08 left. The Panthers forced a three-and-out. Newton threw three straight incomplete passes, but took a hit on fourth down and still completed a 35-yard catch-and-run pass to Torrey Smith to reach the Philadelphia 34. A 22-yard pass to Christian McCaffrey gave Carolina first down at the 4. Newton ran it to the 1, setting up third down. He threw it to Olsen wide open in the back of the end zone. TAMPA, Fla. (AP) — Chandler Catanzaro kicked a 59-yard field goal, the longest ever in overtime, with 1:50 remaining. Redeeming himself after missing an extra point, as well as a 40-yard field goal on the final play of regulation, Catanzaro’s kick barely made it over the crossbar to end Tampa Bay’s three-game skid and hand the Browns (2-4-1) a NFL record-tying 24th consecutive road loss. Cleveland, which has played four overtime games this season — most for a team since Arizona won all four it played in 2011, and tied for second most in NFL history — doesn’t have a road victory since winning in overtime at Baltimore on Oct. 11, 2015. The Detroit Lions also dropped 24 in a row away from home from 2001-03. Jameis Winston and DeSean Jackson scored on 14-yard runs for Tampa Bay (3-3). Rookie Ronald Jones II added his first pro TD on a 2-yard run that put Tampa Bay up 23-9 heading into the fourth quarter. The Browns, who had 126 yards of offense through three quarters, used Nick Chubb’s 1-yard TD run to cut into their deficit and pulled even on Baker Mayfield’s 16-yard pass to Jarvis Landry with 2:28 remaining in regulation. BALTIMORE (AP) — Justin Tucker missed the first conversion of his career after the Ravens scored the potential tying touchdown with 24 seconds left. Drew Brees threw two touchdown passes, locked up two more milestones and engineered a comeback that enabled the Saints (5-1) to wipe out a 10-point deficit. It was 24-17 before Joe Flacco directed a beat-the-clock drive covering 81 yards and ending with a 14-yard touchdown pass to John Brown. That seemingly set up overtime, given that Tucker had connected on 112 straight extra points and was the only NFL kicker without a miss since the placement of the ball was moved back in 2015. He made the first 222 tries of his career. LANDOVER, Md. (AP) — Redskins linebacker Ryan Kerrigan’s strip-sack of Cowboys quarterback Dak Prescott was recovered for a touchdown by Preston Smith with just under five minutes left and Washington held on when a last-second field-goal attempt by Brett Maher went off the left upright. What would have been a 47-yard kick became a 52-yarder when Louis-Philippe Ladoceur was called for a snap infraction. The Kerrigan-Smith play that provided the winning points was Washington’s fourth sack of Prescott, who appeared to use smelling salts after taking a shoulder to his helmet at the end of a run in the first quarter. Prescott lost two fumbles in the game, including one on an earlier fourth-and-1 keeper. The Redskins (4-2) won consecutive games for the first time this season and stretched their lead atop the NFC East. They also dropped the Cowboys to 0-4 on the road, 3-4 overall, as they head into their bye week. SANTA CLARA, Calif. (AP) — Todd Gurley scored three touchdowns and Jared Goff threw two TD passes as the Rams took advantage of four takeaways and a blocked punt. The Rams (7-0) intercepted C.J. Beathard twice and recovered two fumbles to give them seven straight wins to open the season for the first time since 1985. The Rams began 6-0 for three straight seasons in 1999-2001 before losing the seventh game. The 49ers (1-6) made sure that wouldn’t happen this year by repeatedly giving away the ball, justifying the decision the NFL made to flex this game out of prime time following the season-ending knee injury to San Francisco quarterback Jimmy Garoppolo. Beathard has thrown seven interceptions and lost three fumbles in four starts as the 49ers have committed 14 straight turnovers since their last takeaway on Sept. 30 against the Chargers. The Rams dominated defensively with Aaron Donald recording four sacks, a forced fumble and a fumble recovery; linebacker Cory Littleton having two sacks and a blocked punt for a safety; and Troy Hill and John Johnson III intercepting passes. CHICAGO (AP) — Tom Brady threw for three touchdowns and the Patriots hung on when Kevin White got stopped at the 1 on a 54-yard pass from Mitchell Trubisky. About four or five defenders swarmed White after he leaped to haul in that long heave, preventing him from crossing the goal line while preserving the fourth straight win for New England. The Patriots (5-2) also got two special teams touchdowns and came out on top even though they were missing Rob Gronkowski. The five-time Pro Bowl tight end missed the game because of ankle and back injuries. Brady improved to 5-0 against Chicago (3-3), one of five teams yet to beat him. He was 25 of 36 for 277 yards and an interception. Cordarrelle Patterson ran a kickoff back 95 yards for his sixth career return TD. Kyle Van Noy became the first New England player in 22 years to return a blocked punt for a touchdown. Dont’a Hightower blocked the kick. Rookie running back Sony Michel left in the second quarter because of a knee injury. But the Patriots beat the Bears for the eighth time in nine games since the 1985 team got routed in the Super Bowl. JACKSONVILLE, Fla. (AP) — Blake Bortles fumbled on Jacksonville’s third play of each half, leading to 10 points and his benching. The Texans (4-3) won their fourth consecutive game thanks to those two turnovers and took a one-game lead in the AFC South. Deshaun Watson, who reportedly made the 800-mile road trip by bus instead of plane, had a touchdown pass despite playing with a bruised lung and injured ribs. Lamar Miller ran for a season-high 100 yards and a score. Cody Kessler replaced Bortles in the third quarter and threw a short touchdown pass to T.J. Yeldon , creating speculation he might supplant Bortles in the starting lineup. The Jaguars (3-4) signed Bortles to a three-year, $54 million contract in February with the belief he was good enough to lead the defensive-minded team back to the playoffs. Bortles has been downright awful in three straight losses, with two touchdown passes and eight turnovers. MIAMI GARDENS, Fla. (AP) — Kerryon Johnson rushed for 158 yards and the Lions repeatedly mounted long scoring drives. Matt Stafford was 18 for 22 for 217 yards and two touchdowns. Detroit had 457 total yards and 248 on the ground, with scoring drives covering 64, 85, 75, 65, 75, 63 and 44 yards. The Lions (3-3) punted once and had no turnovers to win on the road for the first time. They’ve climbed back to .500 after being outscored 78-44 in their first two games. Injury-ravaged Miami (4-3) lost at home for the first time this season — and lost another key player. Dynamic receiver Albert Wilson was sidelined in the first half with a leg injury. Johnson carried 19 times and needed barely a quarter to reach 100 yards. LONDON (AP) — Adrian Phillips broke up Marcus Mariota’s pass attempt, the Titans’ second try for a 2-point conversion after a defensive penalty on the first attempt, and the Chargers held on. It was the fourth consecutive victory for the Chargers (5-2), who weathered the absence of running back Melvin Gordon (hamstring) and relied upon their defense to pull out the win. The Titans (3-4) drove 89 yards over the final 4:55 before Mariota’s 1-yard pass to tight end Luke Stocker pulled them within one point. Mariota, who went 24 for 32 for 237 yards with an interception, thought he had scored the touchdown himself. With 40 seconds left, he ran 3 yards on a draw and stretched for the end zone, but replay showed he was down inches shy of the goal line. After Stocker scored, Mariota’s first attempt was a pass intended for Tajae Sharp, an incompletion negated by a defensive holding call on Casey Hayward, and his second, toward Taywan Taylor, was tipped by Phillips. Philip Rivers completed 19 of 26 passes for 306 yards and threw two touchdown passes — one that went 75 yards to Tyrell Williams on Los Angeles’ first play from scrimmage, and one that traveled 55 yards to Mike Williams to cap the first drive of the second half. EAST RUTHERFORD, N.J. (AP) — Kirk Cousins threw two touchdown passes, Latavius Murray ran for two scores, and the Vikings pulled away in the second half for their third straight victory. Vikings wide receiver Adam Thielen became the fifth player in NFL history to get at least 100 yards receiving in seven consecutive games, catching nine passes for 110 yards and a touchdown. Murray, coming off career-high 155 yards rushing against Arizona, finished with 69 yards on 15 carries to help lift the Vikings (4-2-1) to their first win against the Jets on the road after losing the first five meetings away from home. In his first game against the Jets (3-4) since spurning their massive offer in free agency, Cousins was far from spectacular but made some big plays late. With the game still hanging in the balance and the Vikings facing fourth-and-8 from the 34, Cousins connected with Aldrick Robinson for a TD to seal it. Jets rookie QB Sam Darnold was 17 of 42 for 206 yards with a TD pass to Chris Herndon and a TD run, but was intercepted three times as New York’s two-game winning streak ended. INDIANAPOLIS (AP) — Andrew Luck threw four touchdown passes and Marlon Mack had his first rushing scores of the season. The Colts (2-5) snapped a four-game losing streak and finally won their 300th game since moving to Indianapolis from Baltimore in 1984. Adam Vinatieri scored five points to move within five of breaking Morten Andersen’s NFL career record (2,544). The Bills (2-5) lost their second straight, playing this one without injured starting quarterback Josh Allen. Luck was 17 of 23 with 156 yards and extended the league’s longest active streak of consecutive games with a TD pass to 30 — breaking a tie with Dan Marino, Ben Roethlisberger and Matt Ryan for No. 8 all-time. It’s the third time in four weeks he’s thrown four TDs in a game. Mack added 19 carries for 126 yards. Derek Anderson made his first start since December 2016 and the 35-year-old quarterback was 20 of 31 with 175 yards, three interceptions and lost a fumble.